Judge Percy Anderson has dismissed a legal action that claimed Guillermo del Toro's film copied the story of Let Me Hear You Whisper by Paul Zindel. The late playwright's son sued del Toro, the Fox Searchlight studio and others in February, claiming the two works were "in many ways identical". In his ruling, however, the judge said they only shared "a basic premise". 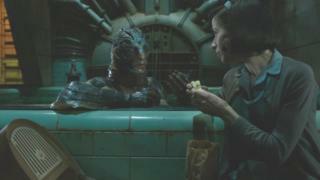 Del Toro's film, which won four Academy Awards in March including best picture, told of a mute cleaner who falls in love with an amphibious creature. David Zindel's suit claimed the film bore a number of similarities to his father's play, in which a cleaning lady goes to work in a laboratory where experiments are carried out on dolphins. Judge Anderson accepted that the plots were similar but ruled that the central concept was "too general to be protected". He also found that the two works "primarily explore different themes", despite there being "minor similarities in [their] expressive choices." His judgement, issued on Monday, dismissed the legal action "with prejudice" and said the defendants were entitled to recover their legal costs. Del Toro himself said he had never heard of Zindel's play and that producer Daniel Kraus had pitched him the idea for the film in 2011. Paul Zindel, who died in 2003 aged 66, was best known for his 1970 play The Effect of Gamma Rays on Man-in-the-Moon Marigolds. The play won him the Pulitzer Prize for drama in 1971 and was turned into a film the following year by actor Paul Newman.